Phytoplankton are microscopic plants that live at the surface of the ocean. There are billions of them in ocean surface waters, which are then grazed upon by millions of zooplankton (including krill), which are eaten by fish, which are eaten by bigger fish, which are eaten by seals and penguins (actually the Adelie penguins eat krill, just like the whales), which are eventually eaten by just a few top predators. Thus, phytoplankton form the base of the marine food web. Phytoplankton photosynthesise, just like land plants, using sunlight to convert CO2 into organic carbon and oxygen (see blog post 13: The carbon team). 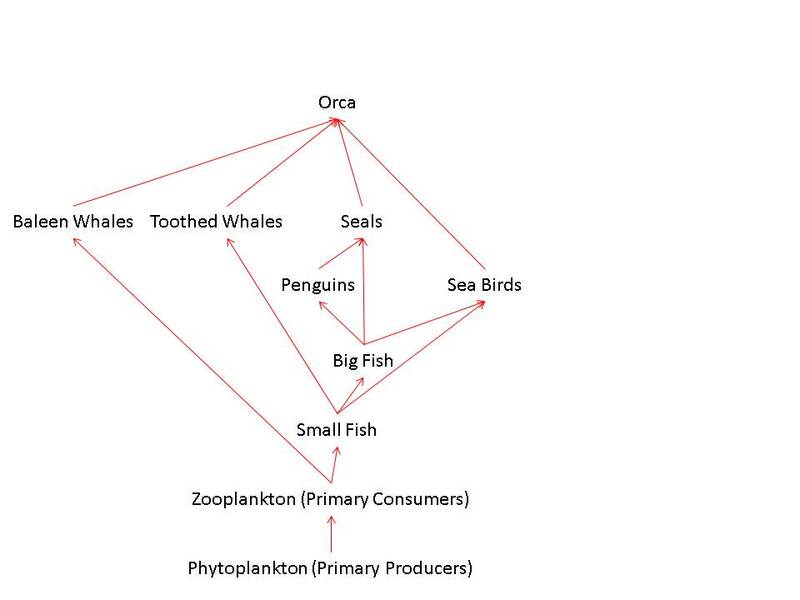 The organic carbon is then used by the whole marine food web, and a small fraction of it eventually ends up in the deep ocean. This process of transferring carbon from the atmosphere to the deep ocean is called the biological pump. As the sea ice melts back each summer in the Mertz Polynya, the surface waters are exposed to sunlight and there is an intense phytoplankton bloom. Due to the upwelling of nutrient-rich deep waters on to the shelf there is no shortage of nutrients (nitrate, phosphate, silicate) to feed this bloom. The phytoplankton also need minor amounts of iron. The iron is locally sourced from upwelling waters, dust (although this is minor in this region, it can be a major component in other areas of Antarctica) and coastal sediment. Some of the resulting biomass then sinks to the sea floor. 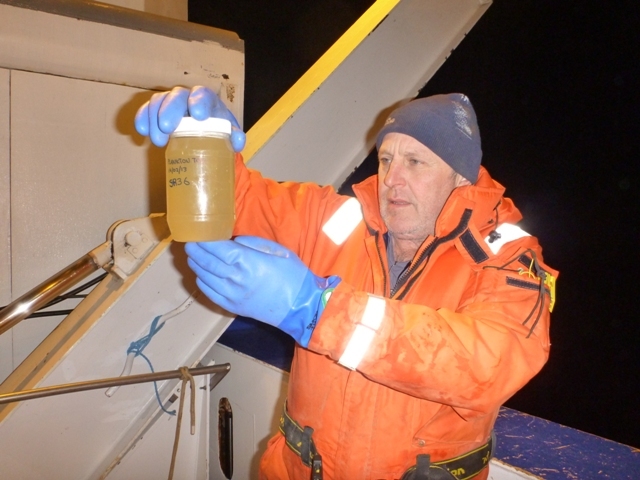 Thus during the brief Antarctic summer the biological pump is active in this region, transferring atmospheric CO2 to the deep ocean, via the formation of the Antarctic bottom water (see blog post 21: The formation of the Antarctic bottom water). 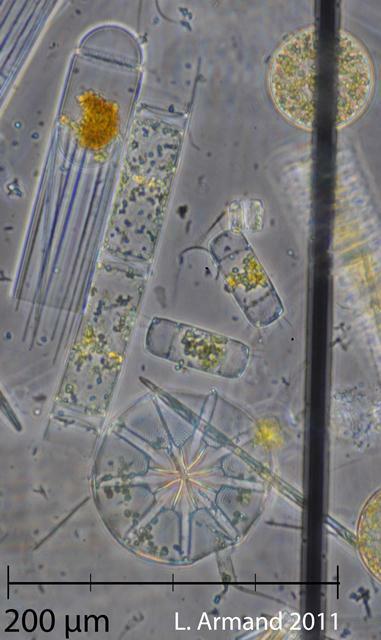 In the Southern Ocean and around Antarctica, the primary producers are diatoms. As well as organic carbon, these also produce a skeleton made out of silica. These silica skeletons are very intricate and beautiful under a microscope. We have been filtering sea water to collect some of these diatoms (and other phytoplankton). We have also been deploying a plankton net – just like a fine meshed fishing net – to see if we can collect any zooplankton. The different species will be identified under a microscope to determine the abundance and changes in the diversity of the assemblage. We will also use the filtered and towed plankton samples to test out some new geochemical proxies on the carbonate and silica skeletons. By comparing the geochemical values with modern environmental data (temperature, CO2, nutrients, salinity), we can produce a calibration. 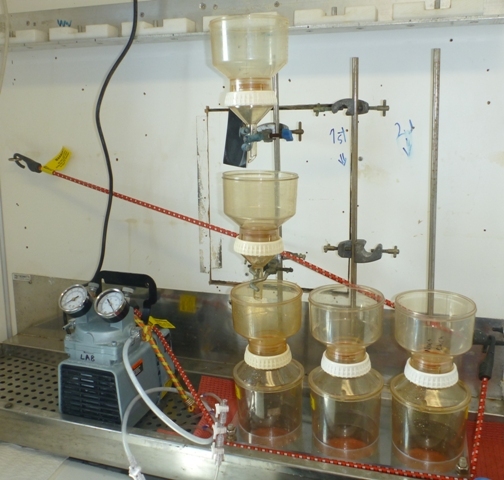 We can then analyse the geochemistry of the silica skeletons of the diatoms, which accumulate in the sediment cores, to interpret environmental changes over time (see blog posts 8: The geology team and coring and 22: Could the past be the key to the present). So while plankton are not quite as photogenic as seals, penguins or whales – at least not with a regular camera as they require a high magnification microscope to view them – these creatures play an central role in the marine food web and global carbon cycle.